*This post is sponsored by the NRPA. I was compensated for this post. All opinions are my own. I don’t know about you, but as a busy mother of four active kids, our local parks are often just what we need to beat summer boredom or jump-start our activity level. An afternoon at the local park helps kids stay active, enjoy the great outdoors and helps support our community. July is national Park and Recreation Month and your local parks are encouraging everyone to come out this month and experience all the wonderful aspects of parks and recreation. All around the country, recreation departments have created and organized events and activities for families – helping families not only spend quality time together, but encouraging them to enjoy the sunshine and stay healthy and on the move! I know that our local recreation department has a variety of summer offerings for families – from day camps to summer concerts, from movies in the park to festivals. Check with your local Parks & Rec department to see what is going on near you! 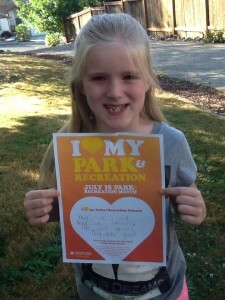 As part of Park and Recreation Month, the National Recreation and Park Association is encouraging everyone to show the love for local parks and recreation and wants everyone to answer the question, “I Love my Parks and Recreation Because…” They have a fill in the blank social media poster that can be filled in and shared, and a fun month-long weekly photo contest that encourages everyone to show and share the LOVE for local parks!The NRPA website includes information on all of the above initiatives, free downloadable resources as well as a calendar of events scheduled nationwide. 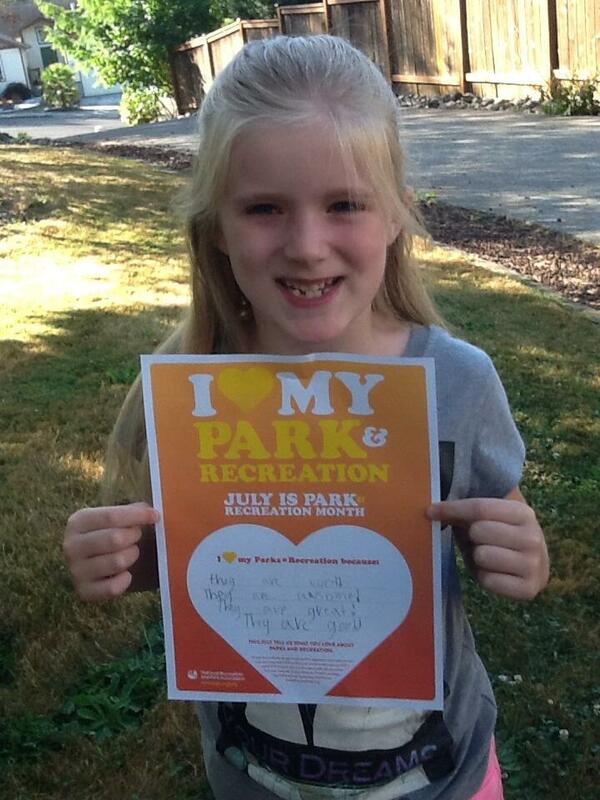 I think we can all agree with Hannah that parks are pretty awesome! So many kids find themselves attached to a screen 24/7, and don’t spend much time outdoors. With the remainder of your summer break, see if you can shift your child’s perspective from how much time they can spend on the computer to how much time they can spend outside! Replace “1 more level” with “1 more time down the slide” or “1 more lap around the bike path!” As a child I was outside until dinnertime, and want my kids to have an outdoor summer as well! While we can always tell them of the fun we had as kids, it is so much better to show them. And you know what, you don’t have to go far to have these enriching experiences that make lasting memories – you just have to head to your local parks and recreation. There are great places right in your community to go have some family fun all summer long!